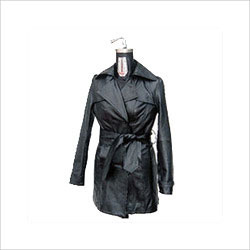 Owing to the rich industrial experience and expertise in this business, we are engaged in providing Ladies Leather Coat. Concord Creations is the foremost company in the field of leather garments. Established in the year 1988, the company is considered as the chief manufacturer, supplier and exporter of a wide range of leather garments. We are offering Men's Jacket, Ladies Jacket, Leather Coat and many more. We are a Partnership based firm. We are well known in the market for delivering superior quality products. Today, we are successfully catering to international markets of europe and canada. Our products have been highly appreciated in the market for their peerless quality and excellent finishing. Being one of the top manufacturers of leather garments, we have been continuously experiencing growth. We export 80% of our products to Europe and Canada.